37 Cooks offered me a splendid chance: Receive a new cookbook, select one recipe to try and write it up. Then the book would be mine, all mine! I jumped at the chance. The book I reviewed is Silk Road Vegetarian by Dahlia Abraham-Klein. It's chock-full of vegetarian and gluten-free recipes from cuisines found along the Silk Road from Central Asia to India. There are curries and pilafs, eggplants and orange blossoms...an enticing feast for the reader, and a treasure for the cook. I chose to cook a lemon-spiked potato salad. As always, I tweaked the recipe a bit to make it my own. For this recipe, I added minced garlic but found that I preferred to omit the diced red onion. It’s important to toss the potatoes with the dressing while the potatoes are still very warm, so that they absorb the dressing and flavors. If you’ll be serving the salad soon, make sure you leave time to let the dish stand at least an hour before serving, to cool to room temperature. On the other hand, if making the thing ahead of time, take it out of the refrigerator at least an hour before serving. It’s best when the salad is only slightly chilled. Friends and family declared this a winner. 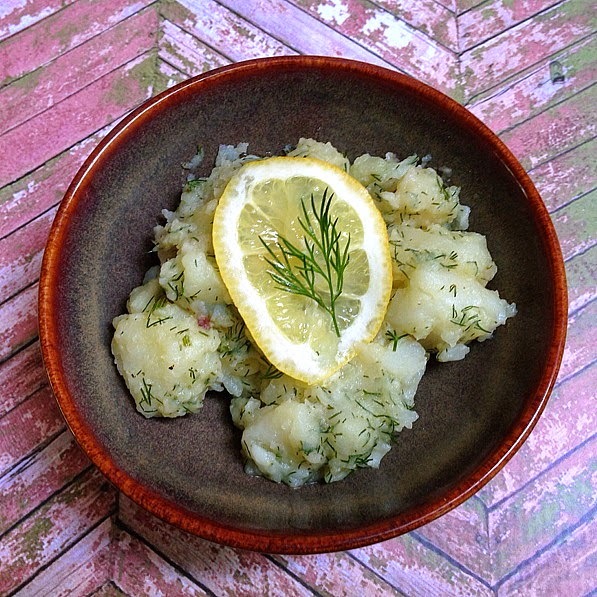 In a medium-sized bowl, combine the lemon juice, dill, garlic, sugar, salt, and Aleppo pepper. Whisk in the olive oil, pouring it in a slow stream. Drizzle the dressing over the warm potatoes and toss gently to coat. If you're adding the onion, toss it in now (I have made it both ways, and prefer it without.) Let the potato salad stand at room temperature for 30 minutes, so that the potatoes can absorb some dressing. Cover and refrigerate for several hours.